Protect your organization against today's toughest threats with our Layered Security Solution. 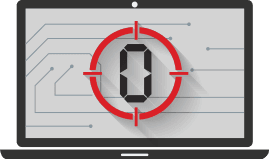 Protect your organization against highly sophisticated threats. Protect your IT assets and keep your business running. Guaranteed protection from virus, malware, spyware, ransomware, and zero day threats. Enforce a multi-layer security using Application Control, file signature, publisher, and user types for complete protection. 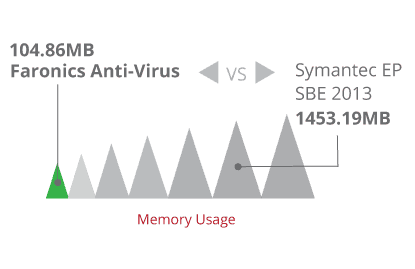 Enforce multiple layers of protection with a powerful anti-malware engine to detect the most complicated malware. 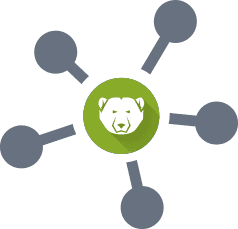 Protect your entire network from sophisticated attacks originating from the Internet using the built-in firewall. 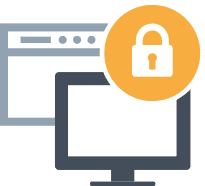 Protect your IT assets from zero day threats and reverse any malicious changes to systems. 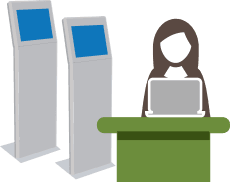 Allow users to access only a pre-defined set of Windows functionality and prevent unauthorized actions on public kiosk systems. Restrict browser functionality to control what users can access on the Internet and disable features within the browsers for complete security. Compatibility with Faronics Deep Freeze ensures computers are protected, definitions are updated and retained across reboots. Protection from threats like zero-day attacks, mutating malware and advanced persistent threats. Block .EXE, .DLL, .COM, .SCR, .JAR and .BAT and other executable files. Comprehensive protection from malware, ransom ware and other security threats. Only allow trusted application and block everything else for complete protection. Folder-level protection feature allows specific folders to be exempt from protection regardless of their location. Expanded flexibility options to allow or block execution of applications regardless of location. 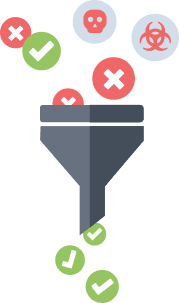 Temporary Execution Mode to allow unrestricted file execution for a specific time period and ability to run a report on executed programs during Temporary Execution Mode. Unique protection levels for Administrators, Trusted, and External users. Granular control of publishers with four-levels of control for expanded protection. Display a customized violation message when a user attempts to perform an action that is not authorized. Stealth Mode hides the presence of Anti-Executable while keeping the computer fully protected. Log of all unauthorized installation attempts and scanning of remote workstations to augment control list and policies. Launch only predetermined applications upon start up with in-built Kiosk mode functionality. Block access to specific menu items and hot-key combinations and restrict access to any application on the workstation. Create a list of allowed or restricted web sites by domain name, IP address, or range of IP addresses and domain names. Prevent macro shortcuts within Microsoft Office programs and use of Visual Basic for Applications and prevent access to VBA through Microsoft Office. Control or block network and web-based data storage. Restrict opening and saving of files with specific file extensions. Control Panel and Desktop Restrictions. Restrict access to user accounts. Prevent right-clicks on desktop icons or hide them completely. Implement Windows Explorer restrictions. Prevent drag and drop functionality. Prevent delete, rename, and folder creation and Restrict access to UNC path. Regulate Start Button Functionality. Hide the Start Button or disable right-click functionality. Customize options available in Start Menu or force the Classic style Start Menu. Control which features and options are available within Microsoft Internet Explorer and Mozilla Firefox. Prevent right-clicks within the browser. Prevent users from changing the default homepage. Control read access with option to block saving data to the Hard Drive, CD, DVD and USB devices. Restrict user access to specific printers or restrict the number of pages a user can print. Seamless integration with Faronics Deep Freeze allowing configuration and activation settings to be changed without reboot or thawing the workstation. Ensure effortless anti-virus definition file updates on “Frozen” workstations without the need to set maintenance period. Automatically enters Maintenance Mode when it detects that a Deep Freeze Maintenance Event has Thawed the computer. 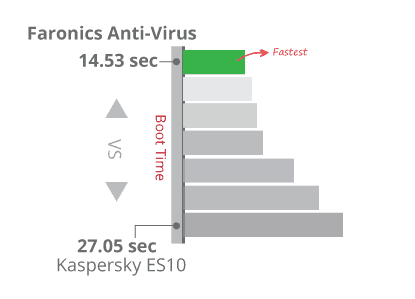 Keep your data safe, your computers running fast, and remain infection-free with Faronics Anti-Virus. 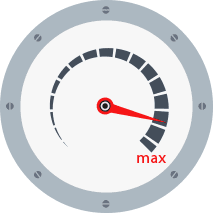 Average Boot Time measures the amount of time taken for the machine to boot into the operating system. Shorter boot times indicate that the application has had less impact on the normal operation of the machine. Installation Time measures the time required by the security software to get installed, be fully functional and ready to use by the end user. Lower installation times represent security products that are quicker to install. Installation Size measures the total disk space consumed by all new files added during a product’s installation. Less disk space consumption means more available space for other files or media on the disk. Average Scan Time on Schedule measures the amount of time required to run a scheduled scan on the system. A shorter scan time means a reduced impact due to the scan process on the normal operation of the machine. Average Memory Usage during Scan measures the amount of memory (RAM) used by the product during an initial security scan. Lower memory usage results in reduced impact on system performance during scans. Ballston Spa Central School District was struggling to stay on top of infected machines. They needed a more efficient anti-virus solution that didn’t slow down the network or system performance, and could deliver updates without delays. 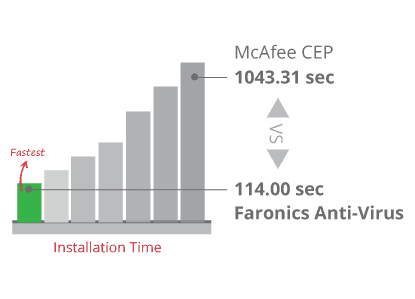 Thanks to Faronics Anti-Virus they can easily manage updates to Frozen machines, plus it’s faster and more efficient at protecting against malware. Now they enjoy peace of mind knowing they have the best protection available — with both run-time and boot-time protection. The IT team at Glenpool Public Schools was frustrated by countless hours spent rebuilding infected machines, not to mention the lost staff productivity. They were overwhelmed by advanced malware, rogue software, and system performance problems. 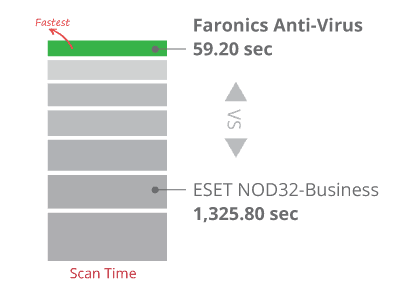 After installing Faronics Anti-Virus and Faronics Deep Freeze, they immediately saw a 90% reduction in IT support tickets. Not only did it allow definition file updates on Frozen machines, but it was more effective at malware detection and had a lighter footprint! With over 4,000 machines, IT administrators at Augusta County Public Schools were plagued by malware infections. They frequently spent 60% of their week troubleshooting damaged PCs. Innocent users accidentally clicked on hazardous malware including the dangerous Conficker Worm. 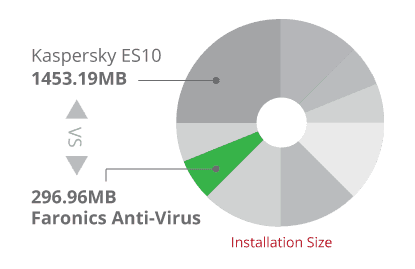 They used a layered approach with Faronics Anti-Virus, Anti-Executable, and Deep Freeze for the ultimate protection. IT support requests dropped by 60% and they can now enjoy 100% machine availability. The extra peace of mind from enhanced security is a real bonus too!